This has become one of my favourite chicken dishes of all time. The beautiful warm spices are balanced by the brightness of lemon and the earthiness of red onions and pine nuts. Perfection. Enjoy! 1. In a large bowl, mix the chicken with the onions, garlic, olive oil, spices, lemon, stock, salt, and pepper. Leave in the fridge to marinate for a few hours or overnight. 2. Preheat the oven to 400°F / 200°C. Transfer the chicken and its marinade to a baking sheet large enough to accommodate all the chicken pieces lying flat and spaced well apart. They should be skin side up. 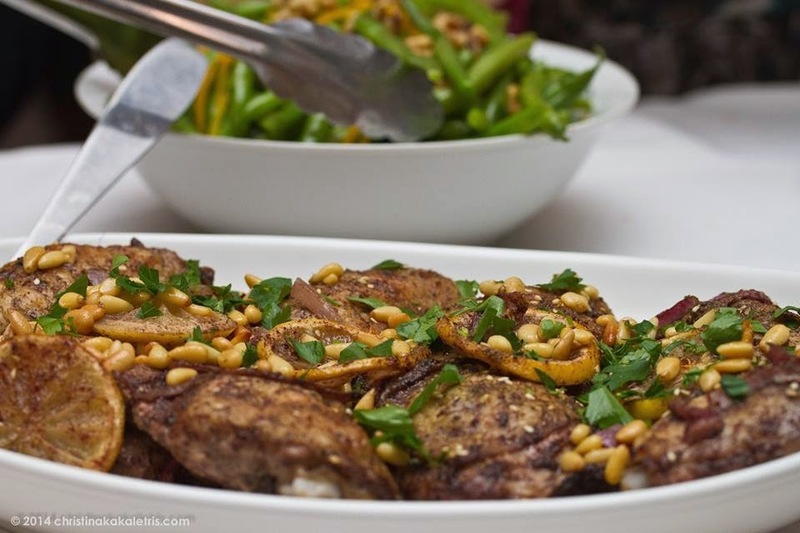 Sprinkle the za'atar over the chicken and onions and put the pan in the oven. Roast for 30 to 40 minutes, until the chicken is colored and just cooked through. 3. Meanwhile, melt the butter in a small frying pan, add the pine nuts and a pinch of salt, and cook over medium heat, stirring constantly, until they turn golden. Transfer to a plate lined with paper towels to absorb the fat. 4. Transfer the hot chicken and onions to a serving plate and finish with the chopped parsley, pine nuts, and a drizzle of olive oil. You can sprinkle on more za'atar and sumac, if you like.